« Reno regrets — How to avoid them? Since giving up coffee, I’m all about teas, and my collection is growing steadily. In addition to my organic peppermint and rooibos with almond, I’ve acquired a lovely green tea with rose and cherry, as well as a fruity green rooibos with mango and papaya that my friend Gaetano brought over the other day as a gift. 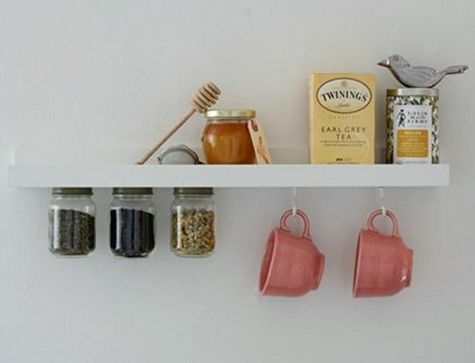 Maybe that’s why I was so drawn to this DIY “tea shelf” on DesignSponge. I hope the new kitchen we’re planning will still leave enough room for little homespun details like this. This entry was posted on Sunday, March 21st, 2010 at 9:55 pm	and is filed under Uncategorized. You can follow any responses to this entry through the RSS 2.0 feed. You can leave a response, or trackback from your own site. love the tea shelf Laura – i think your handy – man can certainly handle that – hehe! would be great for spices too – like all your chai spices – have you ever made home-chai? the best !